Near the ghost town of Rimini, Montana, located in a Rocky Mountain canyon, is the abandoned Susie Mine, part of the Upper Tenmile Creek Mining Area. The Susie Mine was a gold, silver, and lead mine, and has significantly high acid drainage polluted with arsenic and heavy metals. 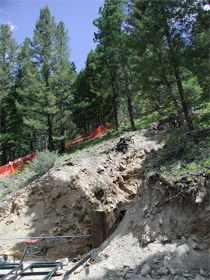 The drainage from this mine is a major source of the heavy metal contamination in streams that flow into the water sources for Helena, Montana. This is a federal Superfund cleanup site that is on the National Priorities List of most-hazardous pollution locations. At this remote site, MSE Technology Applications installed inside the mine a reductive-precipitation process to treat the acid mine drainage to remove heavy metals prior to discharging into Tenmile Creek. In conjunction with this installation, MSE is monitoring and recording measurements such as pH, temperature, flow, and oxygen level in the mine. They then transmit that data via meteor-burst technology to a web page. Using their experience in automation and control, MSE integrated a Campbell Scientific CR1000 Measurement and Control Datalogger into the system, along with Meteor Communication Corporation (MCC) meteor-burst technology. Meteor-burst communication systems transmit data long distances without satellites by bouncing RF signals off of the ionized trails of meteors. Using high-speed digital transmission methods, packets of information can be sent during the brief time the ionized trails exist—from a fraction of a second to a few seconds. The CR1000 acquires and stores data from multiple sensors and transmits the data to a stationary ground unit, from where it is sent to an Internet site. Site monitoring, especially post-closure monitoring, typically requires extensive data acquisition, processing, and storage. Monitoring is also made more difficult because site infrastructure, such as electrical power lines and telephone lines, are removed. This design accounts for these elements. Developed to address sensor and monitoring needs of the Department of Energy (DOE), this data-acquisition system has stood up through grueling Rocky Mountain weather, including large snow falls, strong winds, and intense cold, and has never lost data.